While there are several adhesive systems used on window films today, only one is developed and made exclusively for window film by the world's best adhesive innovator  the 3M Company. 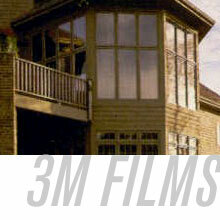 3M window film uses a unique pressure sensitive adhesive with over twenty-five years of performance success unmatched by any other adhesive system. The truth is that window film is only as good as the adhesive behind it. The long-term clarity of window film rests primarily in the adhesive. With that in mind, perhaps the following can help distinguish the good from the very best. Pressure Sensitive Adhesives (PSA): PSAs are common, but not by any means are they all the same. Unlike 3M's PSA's, many are not as durable and temperature-resistant. They tend to develop distortion from thermal cycling and have field failures, such as adhesive bubbling and blistering. Water Activated Adhesives: Water activated adhesives are used in response to some of the PSA clarity shortcomings. These adhesives chemically bond to the glass when activated by a solution. While they improve long-term visual quality, they, too, fall short in performance. First, this adhesive type is essentially permanent, making it very costly to remove. Second, water activated adhesives do not offer the shatter-resistant benefits that PSAs do as they often lack the shock absorption qualities needed to resist glass shattering. Fortunately, there is an adhesive that combines the best performance traits of the above two systems. An adhesive that provides long-term visual clarity, removability, and shatter resistance is offered by only one company  3M.